Shareholders will vote on a "Just vote no" campaign at Mylan's June 22 meeting. Embattled EpiPen maker Mylan (MYL - Get Report) is expressing frustration with Institutional Shareholder Services as the proxy advisory firm prepares a recommendation regarding company executive pay and director nominations that will be brought to a vote at Mylan's June 22 shareholder meeting. In a "Just vote-no" campaign, New York City's Comptroller's Office, on behalf of New York City Pension Funds and in partnership with New York State Comptroller Thomas P. Napoli, the California State Teachers' Retirement System and Dutch pension manager PGGM, are urging Mylan shareholders to vote against six company-nominated directors in an uncontested election. The funds are also urging shareholders to vote no on the company's executive pay packages. "Investors shouldn't be surprised by Mylan's desperate attempt to distort the facts and play by a different set of rules," said New York City Comptroller Scott Stringer. "The record here is clear: even as Mylan directors are today denying Teva ever made an offer, Mylan's own 2015 statement filed with the SEC said its board had rejected 'Teva's proposal.' "
Stringer said Mylan's concerns are "nothing more than an eleventh hour effort to protect Mylan's entrenched board and overpaid leadership. From the Teva controversy, to the EpiPen debacle, to massive executive pay packages, Mylan's directors have a history of costly oversight failures. It's time to hold this board accountable." Collectively, the participating shareholders own 4.3 million shares of Mylan valued at roughly $170 million. The votes are nonbinding, but a big negative vote could embarrass the company into replacing directors or restructuring its CEO Pay Plan. Mylan, possibly anticipating key concerns ISS will raise, Mylan urged ISS to share a draft of the upcoming recommendation prior to submitting the final version. Mylan officials met with ISS researchers on Monday. The next day in a letter to the advisory service, Mylan addressed "three important points" discussed in the meeting. Topping Mylan's concerns was an indication from ISS that the company would not be given an opportunity to review a draft of the ISS report before it is issued. In asking ISS to reconsider, Mylan said, "the facts presented in our proxy this year are complex. Nobody knows the facts better than the company itself and, therefore, we believe that we can be an important resource in making sure that the report is factually accurate." An ISS spokesman, however, said it is ISS policy to deny pre-publication review when there is a contentious or controversial situation such as divisive shareholder proposals, proxy fights or activist campaigns. An interesting aspect of Mylan's issues with ISS is the company's chief legal officer, former Securities and Exchange Commission member Daniel Gallagher. Gallagher, who was a critic of ISS and other proxy advisory services during time on the SEC, was named to his job with Mylan in March. The letter was signed by Mylan non-executive directors Wendy Cameron, JoEllen Dillon, Neil Dimick and Mark Parrish. In Mylan's letter, the company dismissed the notion that the proposals before shareholders constitute a proxy contest or otherwise warrant denying pre-issuance review. "A group of very small shareholders (owning less than 1% of our shares in the aggregate) have voiced their opinions regarding certain ballot items," Mylan said. "They have also expressly and repeatedly stated that they are not soliciting proxies from other shareholders. Therefore, this is not a proxy contest." Mylan concluded, "We cannot see the logic in an outcome where an expression of opinion by shareholders holding less than 1% of our shares may result in a situation where your report is potentially issued to all of our shareholders, including the holders of more than 99% of our shares that have no connection to this small opposition group, with potential factual errors (that could have been corrected if we had been given the opportunity to review)." One of the matters likely to create confusion is the continued role of former executive chairman Robert J. Coury, now non-employee chairman, Mylan said. "As a Dutch company with a one-tier board, the responsibility to set the strategic direction of the company is vested in the board of directors and its chairman," Mylan said. "Therefore, Mr. Coury's role as chairman and leader of the board of directors is not merely an honorary title (as it is sometimes here in the United States), but rather a vitally important role for the company." Coury's 2016 pay as well as pay plan in his new role as non-employee chairman have been criticized by some investors. Mylan also raised concern with the way ISS will address Teva Pharmaceutical Industries Ltd.'s (TEVA) approach to Mylan in 2015.
the board and management were entrenched and Coury and other management desired to be enriched by lucrative compensation packages into the future. 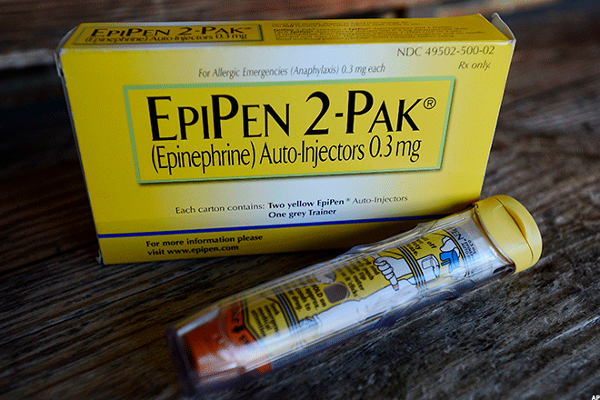 "Nothing could be farther from the truth," Mylan said. "As we have repeatedly stated, Teva never made an offer to acquire Mylan. Furthermore, nobody had more to gain from a Teva offer (if it had materialized) than Mr. Coury, who was one of the company's largest individual shareholders and had change in control-related benefits at the time. Finally, we believe that the preoccupation with Teva's alleged 'offer' that has lingered with your team and certain shareholders is a settled issue that serves, at this point, only as a distraction and ignores the fact that any offer would have been heavily weighted toward stock consideration and given Teva's precipitous stock decline since 2015 would be far less valuable than some have claimed."